When you’re in the production game it’s a challenge to come up with something new and bracing when, for some time, you have already made very good preceding models. I imagine for car manufacturers it can be a nightmare searching for something new, some feature or new technology that will differentiate and separate your car from others. 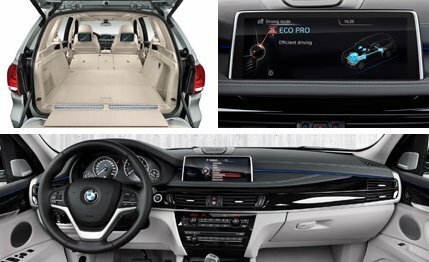 BMW has always been a leader for finding new technology to place in its cars, and the new BMW X5 xDrive40e is bristling with all the luxury, performance, safety and hybrid technology you could want in a modern and attractive SUV package. Seated inside the new X5 hybrid is a comfortable stint. This is the X5 with a difference, and with plug-in hybrid technology and all-wheel drive, you have yourself a great vehicle for city work during the week, and a vehicle that just loves the wide open spaces, too. Thanks to the BMW xDrive all-wheel drive system and dynamic driving characteristics this is a car that is performance orientated, and capable of some very quick acceleration. So just what is the hybrid technology of the new X5 xDrive 40e SUV? Own one of these and you can enjoy some city driving comparable to a small car. The car’s range in purely electric mode can be up to around 30 kilometres, emission-free and with zero fuel consumption. A high-output BMW TwinPower Turbo 4-cylinder petrol engine and a high-efficiency eDrive electric motor are the driving forces of the BMW X5 xDrive40e. A high-voltage battery is stored safely beneath the luggage compartment floor, and when this is fully charged you’re good to go completely free of petrol consumption for up to 30 km when driving conditions and driver style permit. BMW claim that the X5 xDrive40e can return a combined fuel consumption figure of under 4.0 litres/100 km when driving in city situations; this is all thanks to the hybrid-electric technology. Very low CO2 emissions keep the new hybrid X5 at the top of its class in terms of fuel efficiency and low emissions. 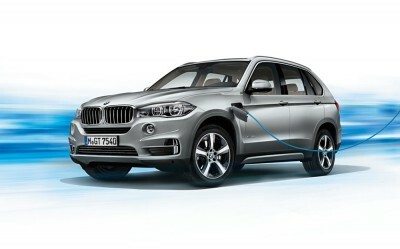 As a plug-in hybrid, the BMW X5 xDrive40e has various different drive modes that allow the driver to choose how much dependency is placed on the electric motor. When the battery is fully charged, you can drive for approximately 30 kilometres without using a single drop of fuel. In AUTO eDrive mode, the optimal recipe of electric motor and combustion engine performance enables excellent efficiency. Obviously, the more heavily you use your right foot, the battery will be used up quickly and the combustion engine will take over the work. Electric driving fun to the max: In the MAX eDRIVE mode, you can enjoy purely electric driving at speeds of up to 120 km/h. At higher speeds or when the acceleration potential has been exhausted, the combustion engine switches on automatically. The combustion engine has the potential to aid recharging the battery; however, the vehicle can be conveniently charged at home from a household 230 volt power socket. Charging stations are also available across many of Australia’s main cities. The car’s charging port is located behind a flap on the front left panel near the front wheel arch. An unladen weight of 2305 kg has the BMW X5 xDrive40e sitting solidly on the road. Remarkably, the four cylinder, 2.0-litre turbo engine performs very well, giving this particular X5 model a top speed in excess of 200 km/h and a 0-100 km/h sprint time of around seven seconds. The vehicle’s maximum output of 180 kW is found above 5000 rpm, while the car’s 350 Nm of torque is available from just 1250 rpm and keeps pushing at this level through to 4800 rpm. A peak torque of 450 Nm and a maximum of 230 kW can be reached with the combination of electric and petrol motors working together. BMW’s TwinPower Turbo 4-cylinder in-line petrol engine combines one twin-scroll turbocharger with Valvetronic, Double-VANOS and High Precision Injection. Start/stop technology is standard. Living up to BMW expectations, the new X5 xDrive40e performs really well and is lively and responsive to drive. Equipped with xDrive has the new X5 permanently all-wheel drive and with a fully variable torque split converter between front and rear axles that enables you to take on some off-road terrain in style. With AWD and features like roof rails and a massive boot with a volume of 1720 litres makes this a very practical vehicle and a perfect companion for the ski slopes. A silky smooth eight speed auto does the job of connecting the engine’s power to the rubber on the road. Big and safe, the new BMW X5 xDrive40e SUV has all the top safety features that earn it a five star in crash testing. An interesting safety feature is the Acoustic Protection for pedestrians, which is a system that artificially generates sound when driving electrically up to 30km/h to protect other road users and pedestrians, warning them that you’re approaching. The new BMW X5 xDrive40e is loaded with kit. ConnectedDrive technology includes state-of-the-art communications technology and integrated internet access for keeping you and your occupants informed and entertained on a long trip. Voice Control is a standard feature. Driver aids include equipment like cruise control with a brake function, a rear view camera, park assist, surround view for parking, Forward Collision warning and Pedestrian warning system to name a few of the excellent features. A premium surround sound system is standard, while climate control makes fine, minute adjustments for that perfect cabin temperature. Dakota leather graces the X5 xDrive40e interior, and even the dash has a stitched leather covering. 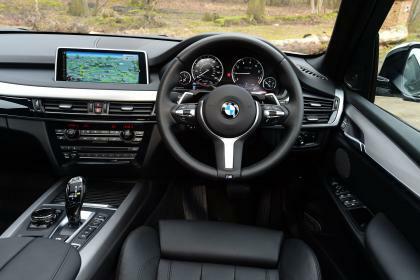 Enter inside the X5 interior and the luxury and refinement greets you warmly. Stylish, refined looks and a really good ride make the hybrid X5 a choice for the discerning SUV driver. For any more information on the BMW X5 xDrive40e or, for that matter, any other new car, contact one of our friendly consultants on 1300 303 181. If you’d like some fleet discount pricing (yes even for private buyers! ), we can submit vehicle quote requests out to our national network of BMW dealers and come back with pricing within 24 hours. Private Fleet – car buying made easy!